On Monday, March 11, 2019 at 7:30pm, The M building will open its doors to one of the “most fascinating and versatile singing artists in the world today:” counter-tenor Max Emmanuel Cencic. * Discover the unpredictable music from the 18th century for the fiery 3rd musimelange’s performance of season 8. EverCook in tandem with Alloy Bistro Gourmet will transport us to Italy with their eccentric hors d’œuvres prepared to pair the extravagance of Max Emmanuel Cencic accompanied by an open wine bar offered and selected by Barton & Guestier followed by scrumptious desserts by Gb Catering and Frice Cream. 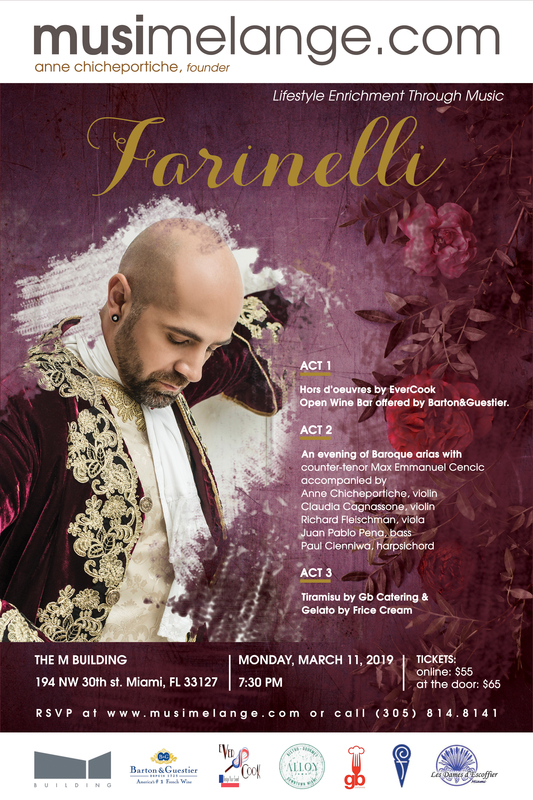 Farinelli on Monday, March 11th, at 7:30pm. in the comfort of the living room in an art gallery: The M Building, nestled in the Wynwood Art District. ACT 1: The event begins at 7:30pm with an open wine bar by Barton & Guestier paired with expertly crafted Mediterranean flavors prepared by our exclusive chef: Vincent Catala from EverCook who will be working side by side with Chef Federico Genovese from Alloy Bistro Gourmet. ACT 2: The concert will start at 8:15pm – a Baroque concert of arias with Max Emmanuel Cencic, counter-tenor –Anne Chicheportiche violin – Claudia Cagnassone violin – Richard Fleischman, viola – Juan Pablo Peña, bass – Paul Cienniwa, harpsichord. ACT 3: After the concert, all your senses will be in harmony and you will have a chance to get to know the artist while tasting exquisite Tiramisu by Gb Catering and smooth Gelati by Frice Cream. * Max Emmanuel Cencic performance is made possible by the generosity of Dr. Marvin Sackner. ** Hors d’oeuvres are generously sponsored by EverCook & Alloy Bistro Gourmet. *** Open wine bar generously sponsored by Barton & Guestier. **** Desserts are generously sponsored by Gb Catering and Frice Cream.